Posted on Thu, Jan 26, 2012 : 1:24 p.m.
An unmarked police car sits with its flashers on outside of the Chase Bank on the corner of N. Huron River Dr. and McAuley Dr. near St. Joseph Hospital after a robbery occurred there. 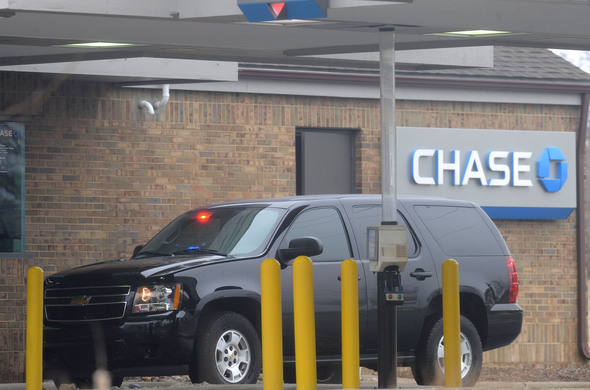 Washtenaw County Sheriff's Office deputies arrested a man after an armed robbery at the Chase Bank near St. Joseph Mercy Hospital in Superior Township. Police responded to the scene, 5485 Huron River Drive, at about 1:14 p.m., according to sheriff's spokesman Derrick Jackson. Jackson said the man passed a note to a teller indicating he had a weapon and then left the building with an unknown amount of cash. He was arrested moments later on Huron River Drive by responding deputies, Jackson said. All of the cash was recovered, Jackson said. Deputies arrested a 32-year-old Ypsilanti man, according to a Nixle alert sent out by the sheriff's office. He has been lodged at the Washtenaw County Jail, the alert stated. Fri, Jan 27, 2012 : 1 a.m.
Great catch WCSD!! Thank You!! Thu, Jan 26, 2012 : 9:11 p.m.
Nice work on nabbing this dirt ball before he could strike again. Glad they caught the guy and everyone is safe. I work at a bank everyday and can't stand the thought of being robbed. Its a desperate world for some people I guess.